and essences in the refugee camps. On th 25th of August of 2012, during the preliminary prayers for the Apparition of the Divine Mother, at the Morro do Cristo Redentor (Hill of Christ the Redeemer) in Carmo da Cachoeira, Minas Gerais, Brazil, Saint Joseph manifested Himself, accompanied by the prophet Elijah, and by Moses. They made a special request to all of us, that we carry out a prayer task dedicated to the devotion of the Most Chaste Heart of St. Joseph for 6 months. After those six months, during the Vigil prayer of February 26th, 2013, in the province of Salta, Argentina, the Blessed Virgin was accompanied by the Most Chaste Heart of St. Joseph, who told us the guidelines for the next six months. In addition to the two prayers that we have recited, He added a prayer that will be recited seven times at the beginning and at the end of the first prayer that we received. "Dear children, today I come in honor of the plans of God, sharing with the Immaculate Heart of Mary Her planetary task in these times. I also want to recognize your perseverance, faith and love to My Chaste Heart of Love for having responded to My requests throughout the last six months. Today I announce to you in the Glory of the Father that we will begin a new task in the world and that it will be united to the missions of Peace that you have brought forward in these lasts months. Many essences and souls have been touched by My Chaste Heart and the work which you have answered must continue in this time. Many souls also need this light so that through My Most Chaste Heart all will be able to find the Christ that will return. When I ask you that you pray the prayer to the Most Chaste Heart on Fridays you will enter in a different state of prayer. Now I ask you for the next six months that you not only pray for the essences of those who are in the refugee camps but also that you contemplate all of Africa, Asia and India in prayer. These are the places where My Heart will work from this moment on and also where will be born new missions because all of the missionaries of peace who work for Christ must unite themselves at the end of this time through fraternity. In this way the works of the Father will be able to be fulfilled by means of the hearts that may answer to the call of God. In this cycle of humanity, the hearts consecrated to My Immaculate Heart shall include in their prayers the devotion to the Most Chaste Heart of St. Joseph. For this reason the devotion to this Heart will allow you through prayer to aspire and work for the law of service and of humility. Another intent implicit in the devotion to this Most Chaste Heart is to repair the faults appearing in the lives of many of My children, such as the lack of humility and of charity towards neighbors. Through prayer the Most Chaste Heart of St. Joseph will help you to intercede before the Most High seeking reparation of all the faults that have been committed. • For a life spiritually rehabilitated by the intervention of this Chaste Heart of Love. Joseph, the Saint Laborer of God, may be the helper between the souls and Christ. This is the great mystery that today is revealed to humanity: that St. Joseph, and His Most Chaste Heart, will be in this time the principal intercessor together with the Immaculate Heart of Mary for all the souls in this 21st century. “O beloved mediator and intercessor Saint Joseph! plead for us before Christ for all eternity. 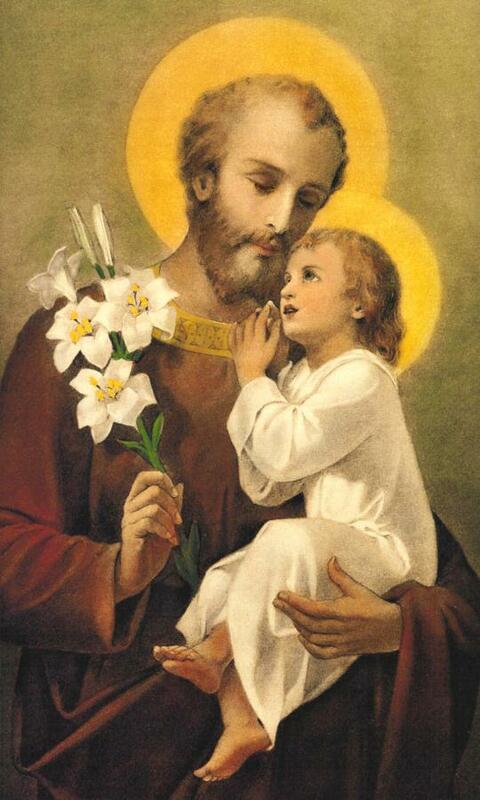 “O Humble and Chaste Heart of Saint Joseph! will fill me with Divine Goods. and of abandoning the past.